Milk Lake in Yading Nature Reserve, Sichuan Province. 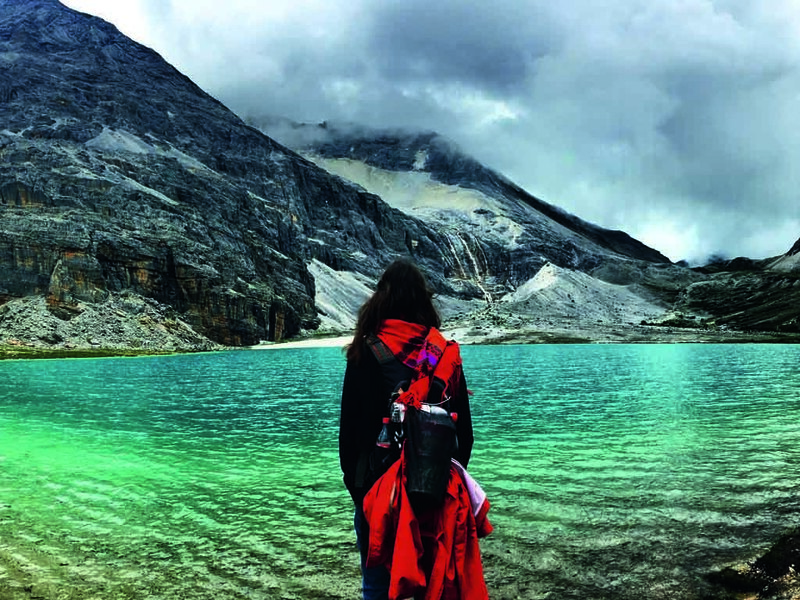 Inspiring, solitary and quiet, this lake sits at an altitude of 4,480 meters. Breathing can be difficult up there. China is a dish of exotic food, maybe spring rolls, a tall and symmetrical ancient pagoda, a lake covered with lotus ﬂowers, the Forbidden City and, of course, the Great Wall. China is a woman wearing cheongsam, an impossible language, strokes of black ink forming characters and a convenience store in my hometown. It is economics, politics, proverbs and sayings, a page of the newspaper and, overall, an unknown place, so far away. I have always believed that every country has something well worth visiting. However, before arriving in China three years ago, I considered China anything but a travel destination. I thought of it as a place to learn a new language or find better opportunities and perhaps wander around. I now realize how mistaken I was. When people ask me where to go in China, my answer is always different. I can’t say that the misty sunset from atop the Yellow Mountain is better than seeing it from the karst landscapes of Yangshuo. Are Tibetan monasteries more impressive than the paddy fields mirroring the sunrise? Sometimes I think nothing could rival drinking tea in the Wuyi Mountains while talking to local tea farmers, but when I stroll Beijing’s alleys among the elderly playing Chinese chess, I don’t want to be anywhere else. Go to Shanghai for skyscrapers and lights and to Hainan for islands and beaches or try Yunnan for elephants, Chengdu for pandas and the Himalayas for snow-capped peaks. The country also has sand dunes and steppes with ethnic minorities and travelers riding horses, yurts, mosques and a 170-meter-tall Buddha. After all these experiences, if I were to travel one country indefinitely for the rest of my life, it would certainly be China. Some people like to stroll around the Forbidden City. What I like most about it is the view from Jingshan Park at sunset. Not only are the huge varieties of landscapes, cultures and buildings fascinating, so are all the different means of transportation to get around the country. From little tuk-tuks and electric motorbikes to airliners, from high-speed trains to buses with bunk beds, the country has options to suit all tastes and pockets. Some prefer ﬂying directly to the final destination to save time. However, traveling by a sleeper train in China is a unique experience. The environment along the way is very authentic. Sitting next to locals and chatting with them can enrich the trip. Along the route, no matter whether sleeping on a hard or soft bed, sitting or standing, people of all ages ﬂood carriages and aisles with instant noodles and nuts. Some snore loudly, and others offer to share an uncommon snack and food they brought in their extensive luggage. Such a trip leaves nobody unmoved. It is part of the surprise of exploring China. The first time I decided to take the slow train, I was looking to travel from Beijing to Xi’an to see the terracotta warriors. My friends and I got to the station three hours in advance to buy the train tickets. I thought it would be plenty of time. After waiting in line for about an hour, there were no tickets left. We were so naive. Naturally, in a country with a population of over 1.4 billion you can’t wait until the last minute to make any decision. First lesson learned! If you want to travel in China, book in advance. We rescheduled everything three days later and then, finally, I experienced an overnight trip by train in China. By that time, sleeping on such a hard mattress with five roommates with the sound of the railway tracks was a challenge. That’s why in the morning after 12 sleepless hours, every inch of my body ached. On top of everything, I was in desperate need of a shower. Clumsily, I sat up on my bed. Next to me was a middle-aged Chinese guy who smiled and offered some sort of snack. I smiled back and waved my hand to let him know I wasn’t hungry. However, he insisted and since I didn’t want to be impolite, I accepted. Everyone around was having breakfast, so I joined them. Shortly afterwards, I started looking for my comb. Maybe brushing my hair would help me feel cleaner, I thought. As I took it out of my backpack, the guy who had shared his food with me said something in Chinese. I nodded, smiling again, but not understanding what he was saying. Then, he took the comb from my hand and combed his hair to look perfect. Second lesson learned! If you pretend you understand the language, suffer the consequences. I had lived in China for about two years before I finally convinced my parents to visit me. They had never traveled to a different continent and had a lot of misconceptions about China. But after showing them tons of pictures and promising they wouldn’t have to share their combs with anybody, they agreed. 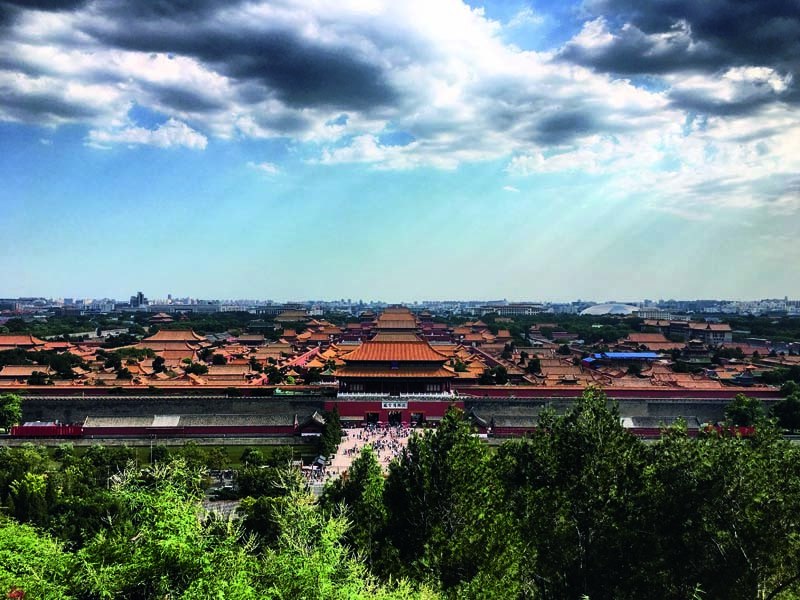 After five days between Beijing’s alleys and rooftops, the Temple of Heaven and the Summer Palace, we took a journey to Anhui Province. We stayed at a small hotel in one of the Anhui villages. My parents really liked the environment. They were curious about every single aspect of Chinese culture and took photos of everything. Moreover, my father, who is a cook, loved trying every local specialty and asking about the ingredients. He doesn’t speak English or Chinese, however. He would still try to communicate in Spanish as if anyone could understand him, which always caused laughs alongside confusion. One day after a long walk around town, he said he felt like cooking. Despite my attempts to explain to him that it wasn’t a good idea, he made me translate his intentions to the hotel owner, an extremely polite woman who couldn’t say no. As a result, we all ended up in the kitchen with the hotel’s chef helping my father cook some Spanish recipes with local products. Later, all of us, the hotel staff and my family, had dinner together. Actually, it was the best part of the trip. The author is an international student from Spain. She currently studies at Peking University on a scholarship from the Spanish Official Credit Institute (ICO).